It’s now time for parties, for gold and stars! 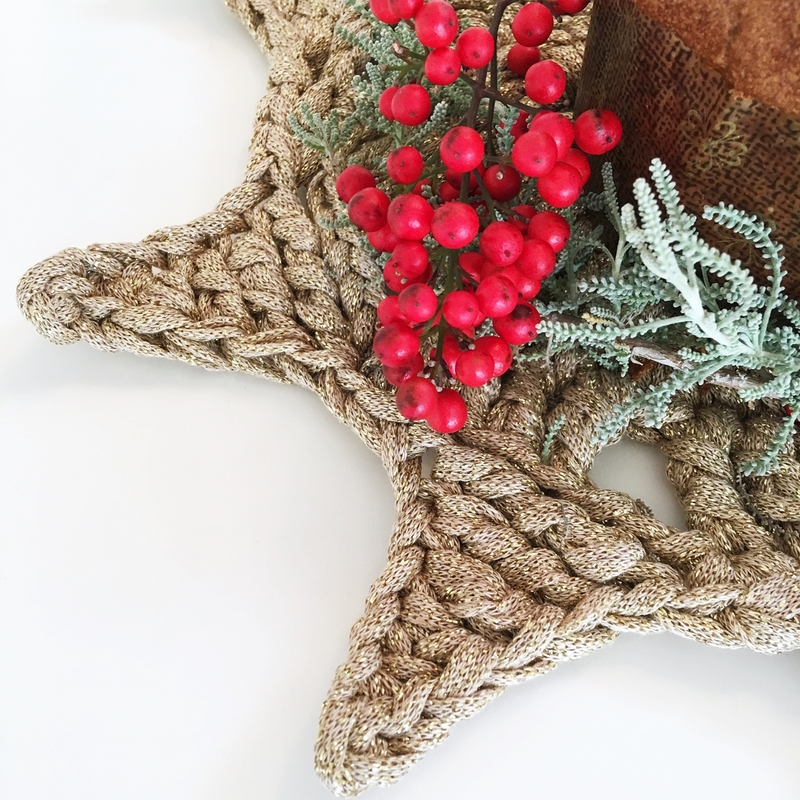 So, this is a Free Pattern for you, to make a crochet tablemat! 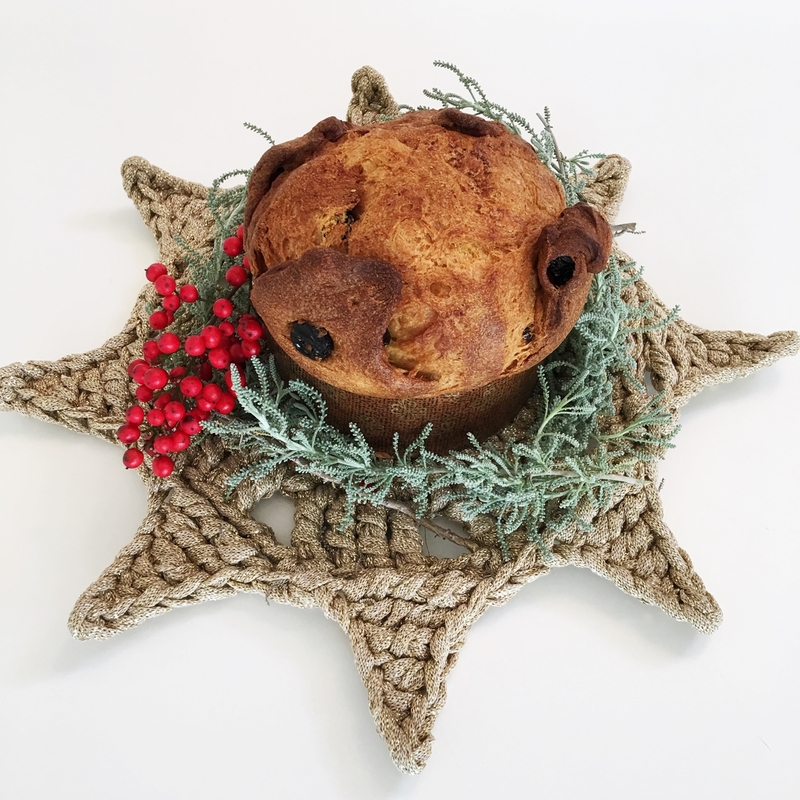 It will be an extra touch on your tables for the holidays! Let’s see! What stitches did we use? The pattern level is intermediate, so it won’t be difficult: everyone can do it with a little patience. – Chain (ch), do you remember how to do it? Here our blog post! – Slip Stitch (slst), for a review look here! – Triple Treble Crochet (ttr). If you need a quick review on all these stitches, you can watch our video tutorials on our YouTube channel! And the materials used for the crochet tablemat? 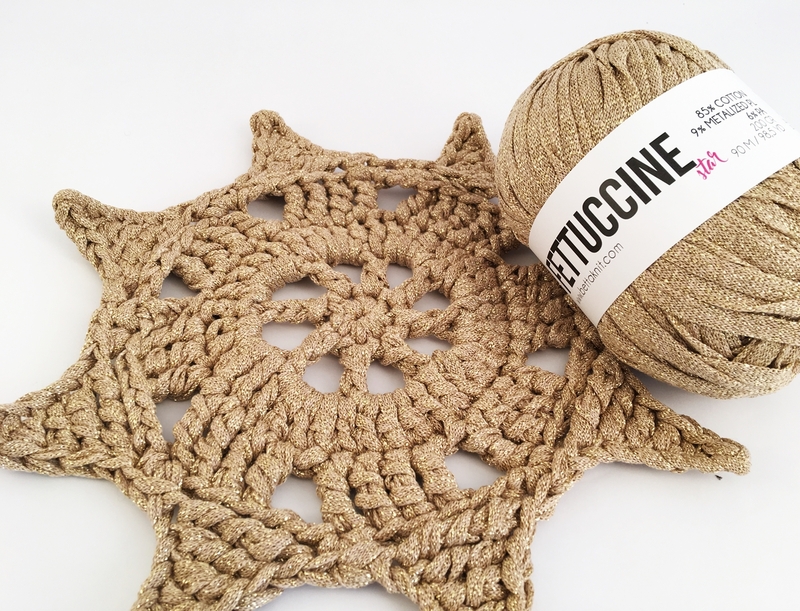 – Fettuccine Star, our new tape yarn in cotton and lurex. You find it here! – Crochet hook n. 9 (M13 US) – you can find it here! Warning! – The chains at the beginning of each round count as the first stitch of that round. Round 1 – 1 ch and 7 dc in the magic ring [8 dc]. Round 2 – 3 ch, then 3 flying ch, (1 tr in the next st, 3 flying ch) repeat 6 times [8 tr]. Round 3 – 3 ch, then 4 tr under the next 3 ch, (1 tr in the next st, then 4 tr under the next 3 ch) repeat 6 times [40 tr]. Slst to the third beginning ch. Round 4 – 4 ch, then dtr in the next 3 st, then 3 flying ch, (skip 1 st, dtr in the next 4 st, 3 flying ch) repeat 6 times [32 dtr]. Slst to the fourth beginning ch. Round 5 – 1 ch and 1 dc in the same st, then 7 ch, slst to the next ch, dc in the next ch, htr in the next ch, tr in the next ch, dtr in the next ch, ttr in the next ch, (2 dc in the same st -the first dtr in the group of four- then 7 ch, slst to the next ch, dc in the next ch, htr in the next ch, tr in the next ch, dtr in the next ch, ttr in the next ch) repeat 6 times [8 triangles]. Slst to the first beginning ch. Once done, close the work, cut the yarn and weave it in the work using a tapestry needle. Here is your crochet tablemat! Now you just have to make one for each diner, so your party table will shine even more!